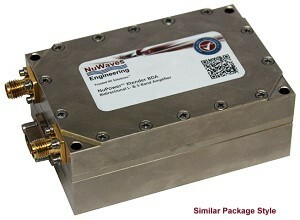 NuWaves Engineering announces the development of a 20 W, C-band, radio frequency bidirectional amplifier module for communications, telemetry and electronic warfare markets. Middletown, Ohio, March 8th, 2017 – NuWaves Engineering, an international Radio Frequency (RF) and Microwave solutions provider, announced the development of their latest miniaturized C-band bidirectional amplifier (BDA) to their line of NuPower Xtender™ bidirectional amplifier products. The NuPower Xtender™ 06D05A BDA module, part number NW-BA-06D05A, follows the recent releases of both the C-Band Low Noise Amplifier (HILNA™ CX) and the C-Band Power Amplifier (NuPower™ 06D05A). This BDA offers the performance of a traditional power amplifier, coupled with a low noise amplifier for receive mode, providing an amplification solution in one miniaturized package for half-duplex transceivers. The NuPower Xtender™ 06D05A will provide saturated RF output power of 20 Watts in transmit mode and 15 dB of gain in receive mode across the C-band frequency range of 4.4 GHz to 5.0 GHz. For complex waveforms that require a linear PA, the 06D05A has an error vector magnitude (EVM) of 4% at 2 Watts of output power. With a nominal input drive level of 0 dBm, the NuPower™ 06D05A offers an impressive 43 dB of RF gain. Further, the PA's aluminum chassis features improved heat dissipation characteristics for higher-temperature operation, and at a compact size of 5.5" x 4.5" x 0.7", it is small enough for integration into a wide variety of air- or ground-based tactical, test or training platforms. With an impressive size, weight and power (SWaP) profile, the NuPower™ 06D05A can be used with communications and telemetry systems to provide range extension or with electronic warfare systems for airborne electronic attack (AEA) at low altitudes, including unmanned aircraft systems (UAS). "We are excited to offer this bidirectional amplifier module. This product is targeted at the military communications market, including unmanned aircraft systems (UAS), filling the gap in the market for small bidirectional amplifiers," said Jeff Wells, President and CEO of NuWaves Engineering. "The NuWaves' team takes pride in our ability to support our clients with best-in-class RF solutions, rapidly fulfilling the ever-changing needs of the Warfighter."